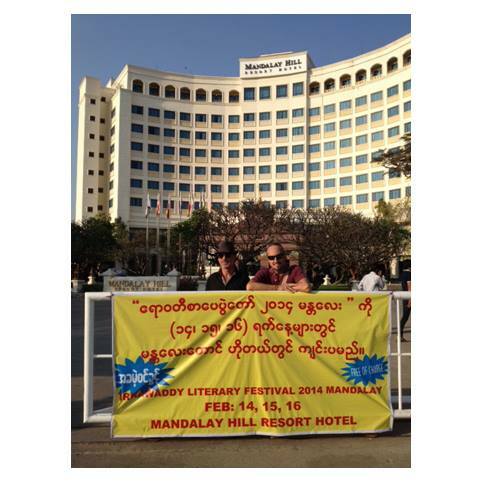 I am at the second Irrawaddy Literary Festival in Mandalay, organized by Jane Heyn, the wife of the former British ambassador to Myanmar. This second festival is held in Mandalay and has been in preparation for almost a year. Top writers appearing this time around include Jung Chang, Louis de Bernieres, and Thant Myint U.
Daw Aung San Suu Kyi put in a couple of appearances today. Crime Wave Press is here to present some of our new titles and photographer Hans Kemp and I did a multimedia presentation yesterday on Burmese Light, our new illustrated title. I took part in a panel on crime fiction with Douglas Kerr and Duncan Jepson, read from my novel The Cambodian Book of the Dead and moderated a reading and talk for our author Jame DiBiasio who presented his first novel Gaijin Cowgirl. From the start, the festival has apparently faced opposition from conservative forces in Burma and hours before the opening dinner on Friday, the minister of culture who had originally suggested the festival be held around the Kuthodaw Paya, a historic pagoda in Mandalay, sent a letter to the organizers, suggesting the location was not suitable after all. With almost a hundred writers, many from abroad, already gathered, and the world’s eyes on the festival, Burma appeared to be trying to prove that it remains a basket case, a tropical backwater beset of schemers much like U Po Kyin, the corrupt magistrate in Orwell’s Burmese Days. Yes, Myanmar remains a country quite unlike any other (to paraphrase Kipling, another voice associated with the country in its colonial days). Read a great rundown of the controversy by Crime Wave Press author Jame DiBiasio. Read a wrap-up of this conundrum by Jame Di Biasio.